The Marilyn G Rabb Foundation is committed to overcoming social and educational barriers and creating innovative programs that positively impact our communities. 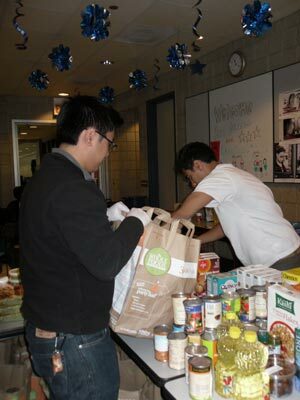 CareTeam: Our CareTeam operates a food pantry, open to the public, year round, called the Food Circle or TFC. The Food Circle, located in the Community Room of the 18th District, passes along donated food from Whole Foods and Trader Joe's to area residents in search of fresh fruits and vegetables. We take reservations for volunteer groups up to 10 people or individuals can drop in whenever they want to! We sort the food, so that we can get an accurate count of each food group and so we can ensure bags are as even as possible. We generally try to group like foods together such as veggies, bread, and proteins as we unpack. We distribute the numbers to patrons in a lottery system at 11. Patrons either wait in the Community Room or leave and return at 12 Noon. From 11 to 12, we will sort the food, take a quick inventory of what we have and then bag between 45-60 bags each of groceries, such as meat and fruits, as well as bread, such as sliced loaves and pies. We distribute bags at 12 Noon based on the number patrons received at 11. (g)love: The CareTeam hosts a winter homelessness outreach, called (g)love. Volunteers descend on a predetermined neighborhood, pack CarePacks (which contain hat, gloves, socks and personal care items), and then walk to streets providing warmth to those who need it. We will deliver 1,200 CarePacks this coming winter to those who don't have appropriate cold weather gear. This has been a really great event for groups of 20 to 25 students. Three years ago, the MGR Foundation rolled out a new initiative called handmade with (g)love, where people make hats and donate them to the homeless. This can be a virtual or remote activity where caring crafters knit, crochet or sew hats and/or scarfs for chilly Chicagoans who lack the appropriate winter weather gear. Our patrons prefer darker colors (like black, brown, tan, navy or hunter) and washable fabrics (like washable wool or acrylic) but the pattern and style is completely up to you! In the past, we have had students learn to knit and then knit for the homeless. For more information on handmade with (g)love please email careteam@mgrf.org. We pride ourselves on having no barriers to participation! That said, we do need our volunteers under 18 to bring a signed parent/guardian permission slip, located here. Volunteers should bring a good attitude and a flexible spirit - we do something different in response to our clients' needs all the time! Also, closed toed shoes are recommended. Participation in our (g)love program works best if you sign up as a group, please see the (g)love event page for more information. The Food Circle events take place every Monday from 10:30 to 12:30. Our calendar only reflects those dates when school is not in session.